That got me thinking, that's probably something other people have wondered about, particularly as it relates to using The Grip, which anyone who's serious about playing this style should buy. So here it is, a PDF with a actual size picture of my hand. 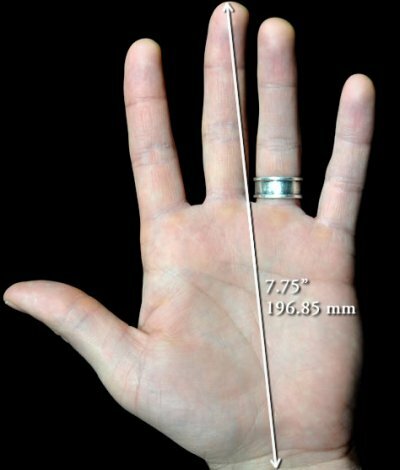 If you print it out on a standard piece of paper, the arrow should be 7.75 inches in length, which is the disance from my second wrist skin fold to the tip of my middle finger. If you're so inclined, post your fretting hand measurements in the comments. Measure from a similar place on your wrist to the tip of your middle finger.